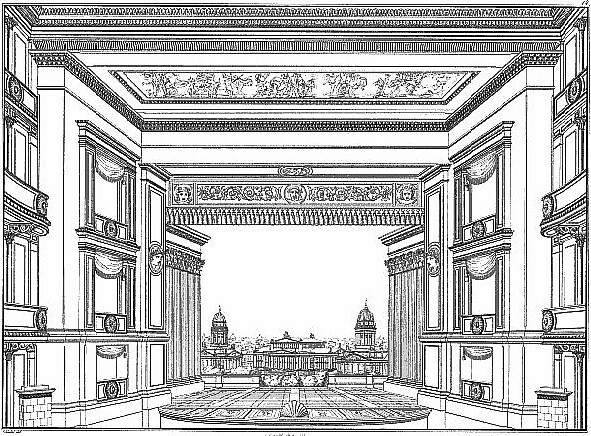 Schinkel telescoped time and space in the Altes Museum, organizing them deliberately into screens of typological allusion and material representation, constantly directing the visitor to the higher purpose of elevating his consciousness. He proceeded accordingly in both private and public commissions. In the Schaspielhaus (State Theatre), for example, built on existing foundations, the celebrated proto-modern articulated window grid recedes behind the requisite temple front. The priviledged playgoer who attended the dedicatory performance witnessed a stage backdrop depicting the theater as seen from afar. Thus the building was once again put on display to be contemplated as a creative work and as a symbol of the ennobling capacity of theater, the most highly self-conscious art form of the period. The curtain did more than parody traditional illusionistic settings. Here again the ironic reversal leads the playgoer (and Sammlung plate collector) to a higher consciousness of his own situation. Hèléne Lipstadt and Barry Bergdoll, "Architecture as Alchemy" in Progressive Architecture, October, 1981, p. 76. [Goethe] described how the curtain rose to reveal to the audience, in a monumental painting by Gropius, a realistic view of the very building in which they were sitting. Barry Berdoll, Karl Friedrich Schinkel: An Architecture for Prussia (New York: Rizzolli, 1994), p. 60. Karl Friedrich Schinkel, Schauspielhaus (Berlin: 1819-21). 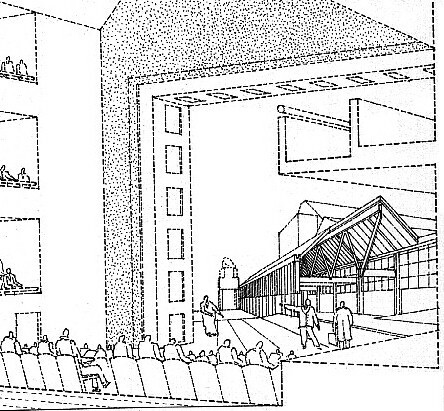 James Stirling, Michael Wilford and Associates, Performing Arts Center (Cornell University: perspective section through proscenium theater with stage backdrop depicting phase one lifting to show backdrop depicting phase two of the building's design, 1983-88). 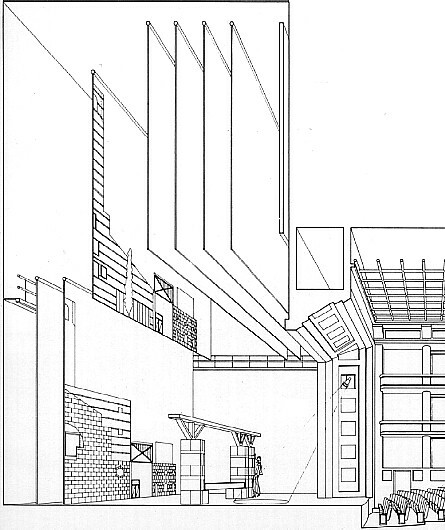 James Stirling, Michael Wilford and Associates, Compton Verney Opera House (Warwickshire: interior view of the opera house with stage backdrop depicting the opera house, 1989).